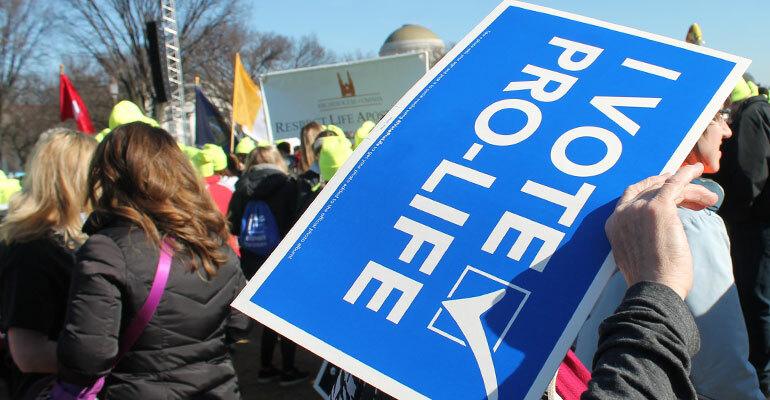 If there were any takeaways everyone could agree on this morning, it's this: pro-lifers won big. New York Times reporter Jeremy Peters noted that it was hard to ignore how much ground values voters gained by electing -- not just Republicans, but solid, reliable conservatives. In the most hotly contested Senate races, where evangelical turnout was highest, pro-lifers were rewarded in a big way that, even the Times points out, "will help the party advance one of its bedrock issues." Obviously, the election of Josh Hawley in Missouri, Mike Braun in Indiana, Kevin Cramer in North Dakota, and Rick Scott in Florida is significant for a lot of reasons, but mainly because they help make for a more ideologically conservative Senate. And evangelicals deserve a lot of credit for that. Nationally, they were within a point of their average turnout in the midterm elections -- 26 percent -- but in states where a battleground Senate seat was in play, they outperformed almost every other demographic. As CBN's David Brody tweeted last night, the power of the evangelical was on full display in the four races that snatched the Senate out of the Left's reach. Evangelicals' enthusiasm turned out 30 percent in Florida, 38 percent in Missouri, 37 percent in North Dakota, and a whopping 40 percent in Indiana. All states where FRC Action was in action (see story below). These turnout numbers are anywhere from a four to 13-point participation boost in states that flipped conservative! Some of that excitement had a spillover effect on governors' races, delivering two very important states in advance of 2020: Ohio and Florida, where Mike DeWine (R) and Ron DeSantis (R) will now have a major say in abortion funding and election redistricting. In the three states where voters had the opportunity to directly decide life issues, Alabamans and West Virginians did -- giving the green light on two ballot initiatives that will officially spell it out in both state constitutions that abortion is not a fundamental right. Even in the House, where Republicans experienced the biggest setbacks, most -- not all -- of the GOP members who lost were not strong conservative leaders. There were a couple in difficult districts. But by and large, what these midterms did was squeeze out the moderates. "Voters have sent 19 House Republican incumbents and counting home..." Roll Call explains. "The losses cut across all factions of the Republican Conference but most of the incumbents going home after this term are moderate members. With the number of House Republicans shrinking next year, conservatives are poised to become a larger portion of the conference." So what we're witnessing -- and this has been happening over the last 12 years -- is a refinement of the House, where the GOP is actually becoming a more condensed bloc of ideological conservatives. Of course, Democrats chased the moderates out of their party years ago, so in many ways, the margins are gone. That only helps position movements like ours to act. When Congress reconvenes -- even with the gavel in Democratic hands -- Americans may begin to see true conservative leadership emerge. And that may be the greatest victory of all.